Exit polls predict Theresa May's win in these elections. However, her popularity has seen a dip in the past three weeks. 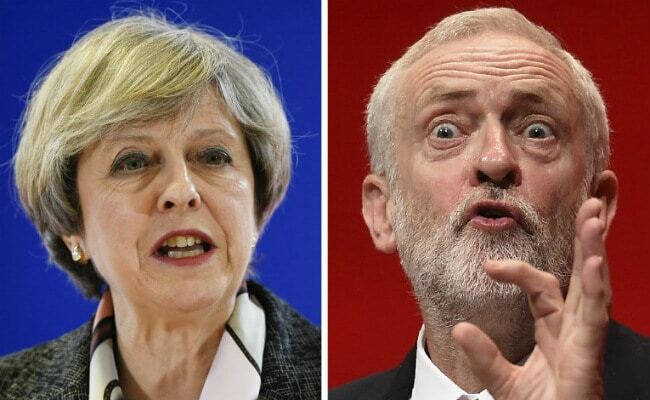 UK General Election: The contest to be Britain's PM is between Theresa May and Jeremy Corbyn. New Delhi/London: Britain goes to polls today after the country's Prime Minister Theresa May announced general elections on April 18. The national election is the election for the House of Commons or the lower house of parliament much like India's Lok Sabha. Voters are asked to elect a member of parliament for their local constituency, which on average have about 72,000 voters. The biggest party theoretically must win at least 326 seats of the 650 regional constituencies. But in practice, the threshold for a majority is around 323, because the Irish republican Sinn Fein party does not take up any seats it wins in Northern Ireland. The candidates in the fray for the top position are Theresa May representing the Conservatives and Jeremy Corbyn representing Labour. The opposition Labour Party polls better with younger voters, while Theresa May's ruling Conservatives are more popular with older generation. This becomes key since this year's voter registration saw a huge spike among young people, with nearly 250,000 applications from under 25s on the day of the deadline. In all, more than one million people under 25 have registered to vote since the election was announced in April, compared to around 700,000 in the same time period ahead of the 2015 election. Fewer over 55s have registered this time around compared to two years ago. If the government has a small majority or needs to enter coalition, its ability to run the country will be typically tested by a vote on the Queen's Speech -- a speech at the start of a parliament setting out a legislative agenda which has been prepared by the prospective government and is read out by Queen Elizabeth. With the upcoming negotiations on Brexit left to the winner of the snap poll or election that was called earlier than the fixed term, the stakes could hardly be higher. The campaigning had been suspended twice, after UK was struck with terror attacks in Manchester and London, both claimed by ISIS. Currently, Theresa May's Conservatives hold a working majority of 17, which she hopes to increase. Several polls indicate she will win, though it is unclear by how much. The British Parliament was officially dissolved on May 2 and all 650 seats declared vacant.